Sea levels are rising, there’s no use denying it. How will we adapt to changing coastlines as shorefront buildings and roads become inundated? So many individuals, families, and organizations who own oceanfront property are at risk. Is shore protection—building barriers to hold back the sea—the only viable option? Map projection of 216-foot rise in sea level. So long, Florida! Source: National Geographic, 2013. Setbacks. Prevent anyone from developing certain lands that are too close to the water, and thus vulnerable to sea-level rise. Rolling easements. Prohibit shore protection without restricting what else people build on the property. Laissez-faire. Let people develop and shore-protect to their heart’s content! Just stop subsidizing it for them, until nature and economics convince landowners to let their properties be submerged. Each of these approaches has merit. With the first option of setback limitations, any property that’s large and deep enough to avoid total submergence will still be useful to the owner; a person could build a house on a higher part of their yard, for instance, further away from the ocean, without fear of losing it to a rising shoreline. Building in a setback area, away from water and on high land, can protect many shorefront structures from sea-level rise. Image created by Casey Dziuba. The laissez-faire option speaks for itself: Yes, a person or organization could keep paying for structures and technology that hold back the rising sea on their property, but at some point that tactic will be too expensive to bother with anymore. The most interesting option of the three, rolling easements, sounds like the best of both worlds. Forbid shore protection. No one may build structures, such as bulkheads, that prevent the movement of naturally migrating shores. Government purchases property rights. When the sea level rises a certain amount, the government can take possession of those private coastal lands. Property deeds shift boundaries over time. As the water level rises, property deeds will shift the boundary between publicly-owned tideland and privately-owned dry land. Government statutes. Government statutes must pass, declaring all coastal land as subject to a rolling easement. Titus provides a wetland prototype policy to illustrate his point, with rules prohibiting the filling of privately owned land any further than keeping the property “useful,” such as building a driveway. Furthermore, the example highlights that during a property’s first decade as public land, residents would not be forced out, but instead charged rent that starts at a fraction of market rate and increases annually. This rent money could eventually be used to clean up the site when it becomes public land and the property owner vacates it. 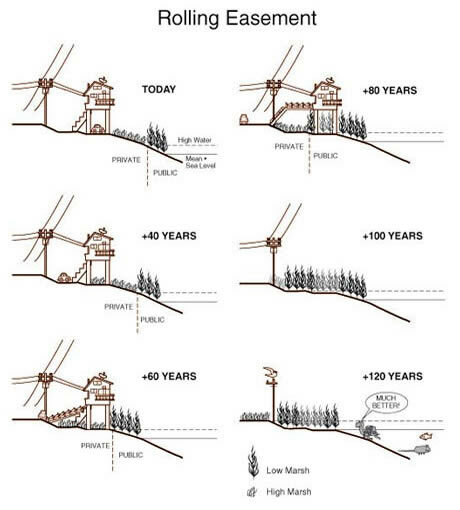 Diagram of rolling easement’s conversion of private property to public land over time. Source: J.G. Titus, 1998. Rolling easements have real potential to change the behavior of property owners. The most obvious impact is that of deferred (or foregone) maintenance; landowners will be less likely to make major property improvements when their properties are destined to become unsellable public land. This attitude could even change the socioeconomic makeup of beachfront residents from more full-time property owners to more full-time renters. Most homeowners expect a return on investment for the price of their home and its upkeep on a timescale of decades. Would-be landlords, however, can get a return on their investment through rental income on a much shorter timescale. Many renters also tolerate spaces that are not improved or heavily maintained over time, if they can negotiate a lower rental price. In such situations, beachfront landlords could recoup their property investment from tenants at lower and lower rental prices as the property deteriorates (while still maintaining basic legal habitability). This could all be accomplished before the pre-determined timespan when the rolling easement transfers the property to public ownership. There are many actions we can take to cope with sea-level rise. Rolling easements present options that most Americans haven’t yet considered. They could provide a path that satisfies almost all parties, from those seeking compensation for dwindling beachfront property values to those focused on environmental sustainability. The shapes of the world’s coastlines are changing; it’s time for us to embrace new legal systems that change along with them. Posted in Cities, Future and tagged climate change, sea-level rise, sustainability. I won’t be around to see substantially rising sea levels. But, for those who will still be here, the warning is clear. However, how ‘reliable’ is the 216 foot rise in sea level? It’s not clear how much sea levels are going to rise. What I like about this map is that it makes the effects of sea-level rise easy to see around the entire North American continent. Once the predictions are scaled back from that map’s high estimate, it’s easier to zoom into a coastal state or county map and understand the impact of a smaller sea-level rise at the local level.